Following the Union Army’s defeat of the Confederate States Army the process of Reconstruction was led by many individuals and institutions. The interconnectedness and intersectionality of Dr. Douglass to these reconstructive efforts superabounds in existing documents, reports, memoirs, ephemera, newspaper accounts and lost histories. Major Charles R. Douglass was active in the Grand Army of the Republic. His father, Dr. Frederick Douglass, while not a direct combat veteran was a recruiter for the Union and thusly welcomed into the fraternity of organizations which sought to promote the values of liberty and brotherhood in which hundreds of thousands had made the ultimate sacrifice for. While speculative scholarship has proliferated in recent decades, under the troubling, incomplete and selective guise, or rather paradigm, of “memory history” promoted by popular American historians, there is an unavailability of scholarship on the organizations and networks in which Dr. Douglass ran. 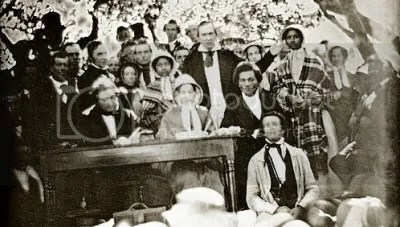 Communities of journalists, politicians, educators, abolitionists, suffragists, preachers and artisans are all groups known to have close associations and connections with Dr. Frederick Douglass but their presence and relevance to the complete story has yet to be told. The folks that yammer about intersectionality have no clue what they are talking about. They have buzz-fuzz cliches and phrases not scholarship and research. In post-Civil War Washington City generals and rank officers were legion. Union veterans Ulysses S. Grant, Rutherford B. Hayes, James Garfield, Chester Arthur and Benjamin Harrison served as American Presidents and Dr. Douglass ran with them all. You scholars already know about General Oliver Otis Howard but who else is known? Among veterans of both the Union and the Confederate States of America Dr. Douglass commanded respect. Few historians who invoke the name of Dr. Douglass convey this truth. Memory historians have failed to uplift the fallen history. W Street Douglassonians are not wrong in expecting lauded historians to muster more than a pseudo-psycho speculative interpretation, or rather a “memory history,” of Dr. Douglass’ April 1876 Oration Delivered on the Occasion of the Unveiling of the Freedmen’s Monument. A focus on this singular speech of Dr. Douglass again, and again and again is an incomplete history, a selective history, a convenient history, a lazy history and most importantly a misleading and dishonest history. Until a new generation and a new collective of historians emerge to challenge the repetitive status quo of simp history half-truths and untruths will masquerade as truth. 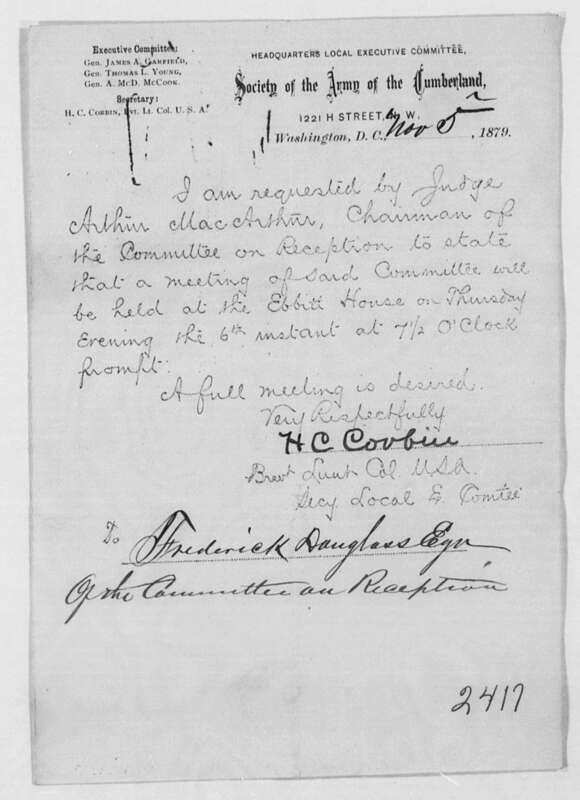 Invitation of General Henry Clark Corbin (via Judge Arthur MacArthur), Society of the Army of the Cumberland, Headquarters Local Executive Committee to Frederick Douglass, Esquire. WASHINGTON, D.C. — Legislation to name a room within the U.S. Capitol Building as the “Lincoln Room” unanimously passed the U.S. House of Representatives today. H.Res.1063, introduced by Reps. Darin LaHood (R-IL) and Raja Krishnamoorthi (D-IL), would name room H-226, which is currently part of the Majority Whip’s office, after Abraham Lincoln. Room H-226 once served as the post office of the House while then-Representative Abraham Lincoln served in Congress from 1847-1849. Congressman LaHood serves a Congressional Chair of the Illinois State Society, with Congressman Krishnamoorthi serving as the Vice Chair. “Having the honor to serve the same nine counties as then-Congressman Lincoln did from 1847-1849 and seeing this legislation pass during the final weeks of Illinois’ bicentennial year is a rewarding way to close out the 115th Congress. With Members of Congress already referring to this room where Lincoln regularly huddled with colleagues, this legislation is most fitting to permanently name this office after Illinois’ most famous son,” stated Rep. LaHood. “It’s fitting that we honor Abraham Lincoln by formally naming after him the room in which he forged so many of his friendships with colleagues from both parties. I’m proud to have joined Congressman LaHood, another son of the Land of Lincoln, in recognizing our greatest president on the occasion of Illinois’ bicentennial,” stated Rep. Krishnamoorthi. This legislation would not be possible without the hard work and leadership of John Elliff, a former member of the Abraham Lincoln Association, who unfortunately passed away this past August. One of John’s goals was to see a bi-partisan resolution brought forward to have this space in the Capitol renamed in honor of Abraham Lincoln. This legislation is also supported by the Illinois State Society of D.C. and The Lincoln Group Inc. of DC. Many thanks to all attendees and participants including representatives and members from the Dorchester County Historical Society, St. Michaels Museum at Mary’s Square, Talbot County Free Library, Waugh Chapel United Methodist Church, Bethel African Methodist Episcopal Church and the Harriet Tubman Museum and and Educational Center at 424 Race Street in downtown Cambridge, Maryland. Thank you to the Dorchester Banner, Visit Dorchester, and the Harriet Tubman Byway for helping get the word out. Special thanks to Eastern Shore historian and author Dr. Linda Duyer and Honorable William Jarmon of historic Pine Street for their kind support and technical assistance. One of 13 statues of Frederick Douglass erected to celebrate the 200th anniversary of the historic icon’s birth was damaged during an attempted robbery early Sunday morning, Rochester police said. John R. Boedicker, 20, of Endicott, and Charles J. Milks, 21, of Kenmore, have both been charged with fourth-degree criminal mischief, a misdemeanor, Rochester Police Investigator Jackie Shuman said. Officers responded to reports at 12:13 a.m. at 1 Tracy St., site of a seminary where Douglass enrolled his eldest daughter, Rosetta, only to withdraw her after finding she was being placed in segregated classes. The six-foot seven-inch statues by Rochester artist Olivia Kim are made out of cast epoxy resin and weigh 40 pounds and were placed on sites of significance to Douglass’ years in Rochester. It was installed earlier this year. Those statues were a part of a project called “Re-Energizing the Legacy of Frederick Douglass,” and in a statement issued Sunday, the project’s leaders Carvin Eison, Bleu Cease and Christine Christopher expressed their disappointment in the vandalism. The trio urged community members to see the vandalism as an opportunity to teach others about Douglass’ legacy rather than be angry about the damage. They also said the statue will be replaced as quickly as possible. Today Boston celebrates the anniversary of its famous tea party. They are not celebrating in Buckingham Palace. As a radical patriot Dr. Douglass knew the revolutionary streets of the Puritan City for more than a half-century. When President John Tyler visited Boston speculation circulated that a delegation of abolitionists, including Douglass, planned to meet him and deliver a petition of demands. In 1849 Douglass spoke at Faneuil Hall. Before embarking on his Grand Tour, a group of Bostonians honored Douglass in September 1886. Did you know in 1873 Dr. Douglass traveled from Washington City to the City on a Hill to celebrate one of the most defining moments of civil disobedience in our history? CENTENNIAL CELEBRATION. – At Boston, yesterday, the New England Woman’s Tea Party celebrated the one hundredth anniversary of the throwing of tea into Boston harbor. About five thousand persons were present. Col. T. W. Higgins[on] presided. Wendal [sic] Phillips made the opening address, giving an historical account of the destruction of tear in Boston harbor. Addresses suitable to the occasion were made by Rev. J. Freeman Clarke, Rev. Mr. Bartol, Lucy Stone, Elizabeth K. Curtis, Mary F. Eastma[n], Henry B. Blackwell and others. Poems were read by Mrs. Julia Ward Howe and Christopher Cranch. Letters from Abby Stuart Phelps, Abby K. Folsom, Ralph Waldo Emerson and others were read. The meeting adjourned after adopting resolution recommending that measures be taken to defeat Mr. Frelinghuysen’s Utah Bill.